Farmers and ranchers have known for centuries that adding nutrient-rich animal manure to their fields and pastures enriches the soil and increases the crop harvest. Composting goat manure gives homesteaders, small farmers and backyard gardeners an inexpensive, simple way to create a rich soil amendment for their gardens and flowerbeds. According to Elizabeth Stell, author of “Secrets to Great Soil,” goat manure possesses more organic matter--but fewer weed seeds--than most other types of animal manure, which makes it an attractive compost choice for many gardeners. Spread goat manure directly on your garden soil approximately six months before planting time, ideally during the early fall. 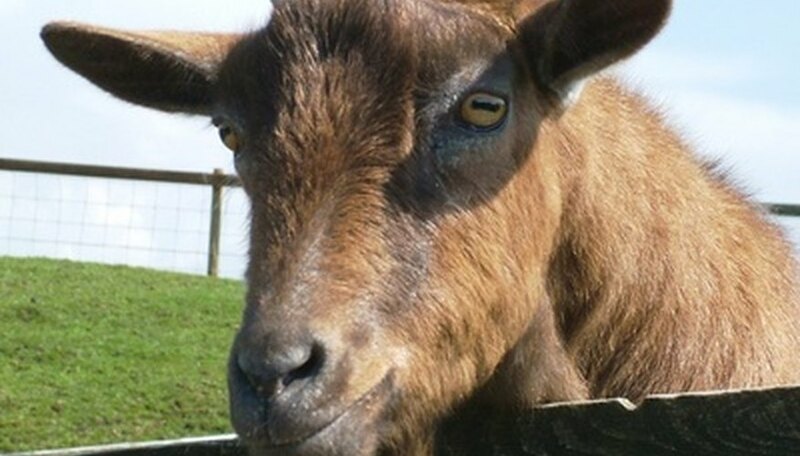 Gather fresh goat manure in a heap by the side of your garden or flowerbeds. Expect the easy-to-handle manure pellets to be well mixed with urine-damp bedding material, such as straw or sawdust, which generally provides plenty of carbon for your compost. Visually check the heap of fresh goat manure as you gather it to ensure that approximately 50 percent of the pile’s volume consists of the manure, which provides nitrogen for the compost. Add supplemental nitrogen-rich waste (such as fresh grass clippings, fruit scraps and vegetable waste) and carbon-rich waste (such as dead leaves, straw or shredded newspaper) to your heap of fresh goat manure, if necessary, to achieve the correct balance of carbon and nitrogen materials. Mix the goat manure and any other nitrogen-dense materials thoroughly with the carbon-rich waste using a manure fork. Scoop the mixed waste over your garden soil, spreading it out to create a 2- to 4-inch-thick layer across the top of the soil. Leave the goat manure and other organic waste materials to compost on the top of the garden soil for approximately six months. Till the broken-down matter into the top 5 to 6 inches of garden soil using a hoe, shovel or roto-tiller, depending upon what tools you have available and the size of your garden beds. According to Stell, goat manure contains approximately 1.1 percent nitrogen, 0.4 percent phosphorus and 1 percent potassium. These nutrient levels exceed those of horse and cow manure but are less than the nutrient levels present in chicken manure. If you're limited on space but would like a readily available source of goat manure, consider raising pygmy or dwarf goats, which generally don't exceed 2 feet tall. Although most cities consider full-size goats to be livestock, check with your city office to see if your local ordinances allow these small-size goats to be raised as pets. Avoid adding fresh animal manure to soil that contains growing plants, as the high nitrogen and ammonia levels in the manure may burn the plant roots.